*Color: Dark grey,Coffee,White floral design. *Material: Cotton canvas, 100% Cotton fabric. *Characteristics: Thickened pure cotton canvas apron, non fading, no pilling or static, dirt-proof, durable, easy to clean. *Applicable: Kitchen, dining room, housekeeping, dinner party, gift,Valentine's Day etc. 1.No bleaching or dry cleaning. 2.There may be a difference of 0.5"-1" due to manual measurement. and 28" wide,ensuring a good coverage which can prevent cloth from overflow or oil splash. (wife).It will definitely be a surprise for them. Size: 32"(L)x28"(W). Ties: 20.5". The size is suitable for most men and women. Adult kitchen apron with inspiring words that smlie,sweet love,home is my castle,it can inspire everyone around you.The colour fastness is high,available for machine wash.
2 pockets which can hold seasoning packets,meat thermometer,grill slips,recipe cards and phone.With an adjustable neck strap that can be easily altered to fit most sizes,making user more comfortable and free. 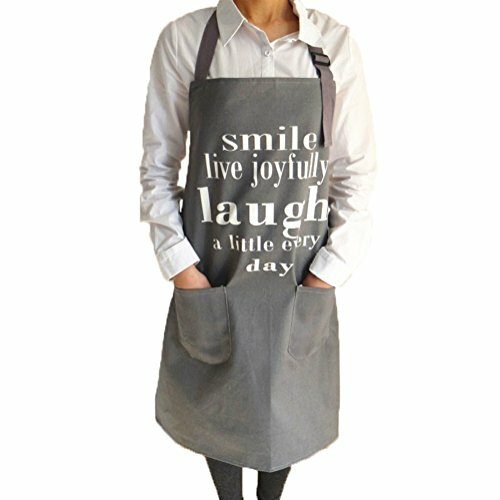 Our apron can be used for cooking, baking, or catering service, coffee house,chef,art painting and gardening.It can also be sent to your mum,dad, friends, husband(wife) as a great gift. SATISFACTION GUARANTEE:Only purchased from EDICP/ (HXOR),if at any point you are unhappy with quality or size, you can return it for a full money back refund. We Take Customer Service That Seriously. If you have any questions about this product by EDICP, contact us by completing and submitting the form below. If you are looking for a specif part number, please include it with your message.